Advanced automation can mean better, more meaningful jobs for workers. A concerted approach to education and training is needed to fully embrace the opportunities being created by today’s rapidly developing automation technology. ABB’s Automation Readiness Index highlights the need for education and ranks 25 countries on their readiness to apply the latest trends in automation. We are no longer gearing up for a future of automation, we are living it. The development of very smart technologies such as robotics and those based on artificial intelligence (AI) now undertake more than simple assembly-line tasks. Factories are being run more efficiently with advanced automation technologies such as predictive maintenance and collaborative operations. ABB for example developed a smart sensor technology for low-voltage motors, pumps and most recently also for bearings, reducing the unplanned still stand times of factories by 70 percent. This has an impact not just on a factory but on society as a whole! A ground-breaking report from ABB and The Economist Intelligence Unit finds that even the large economies of the world already embracing the future of work still must rethink how to prepare the workforce for tomorrow. The report "The Automation Readiness Index (ARI): Who Is Ready for the Coming Wave of Innovation?" ranked 25 countries on their readiness to successfully put into use intelligent automation - machine-learning and AI-assisted automation - in existing industrial operations. The expert panel selected the largest economies of the world (G20), comprising a majority of high-income countries (ten), upper-middle-income countries (seven), and two lower-middle-income countries (India and Indonesia). These are considered to be more exposed to the changes brought about by automation and, consequently, more likely to be developing innovative policies and best practices. Additional countries were selected in consultation with the expert panel on the basis of relevance and geographic representation. Estonia and Singapore were selected on the basis of their advances in digitalization and being potential sources of best practices. The UAE, Colombia, Malaysia and Vietnam were selected for representation of key emerging economies from Latin America, South-east Asia, and the Middle East. 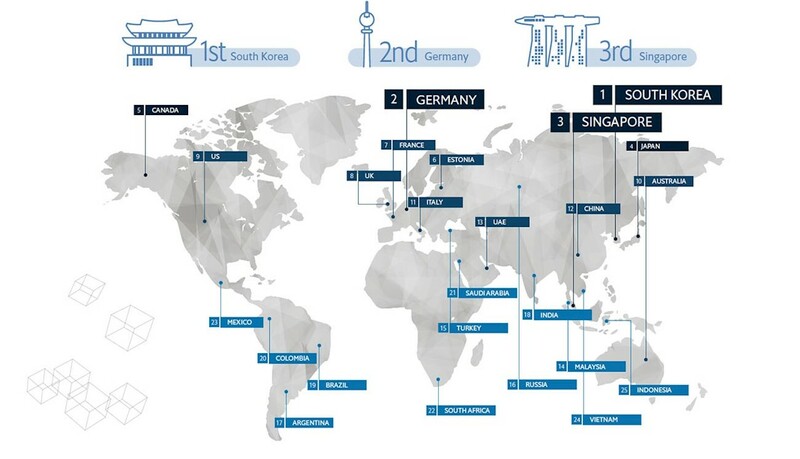 According to the report South Korea, Germany and Singapore are the world’s top-ranked nations in their preparations for smoothly integrating intelligent automation into their economies. Other countries that round out the top 10 in ranked order are: Japan, Canada, Estonia, France, the United Kingdom, the United States and Australia. There is not a single industry today that has not been touched by some form of automation. Yet the study found that many countries worldwide are not prepared to fully embrace the opportunities and challenges being created by today’s rapidly developing automation technologies. The ARI report lays out the importance of training programs that equip current and future workers to operate in increasingly automated workplaces. The fact that the unemployment rate in South Korea, Germany and Singapore are below global averages show that the adaption of automation does not lead to job losses. Experts in the ARI study say the use of automation in performing repetitive tasks will create more meaningful jobs for humans, thereby increasing job satisfaction. As a pioneering technology leader, ABB has been at the forefront of developing products and services that have spurred business productivity in power grids, electrification products, industrial automation, robotics and motion. The company’s cross-industry portfolio of digital solutions for monitoring and controlling automation systems, ABB AbilityTM, is helping manufacturers shape factories of the future by allowing customers to know more about their data and manage it efficiently. 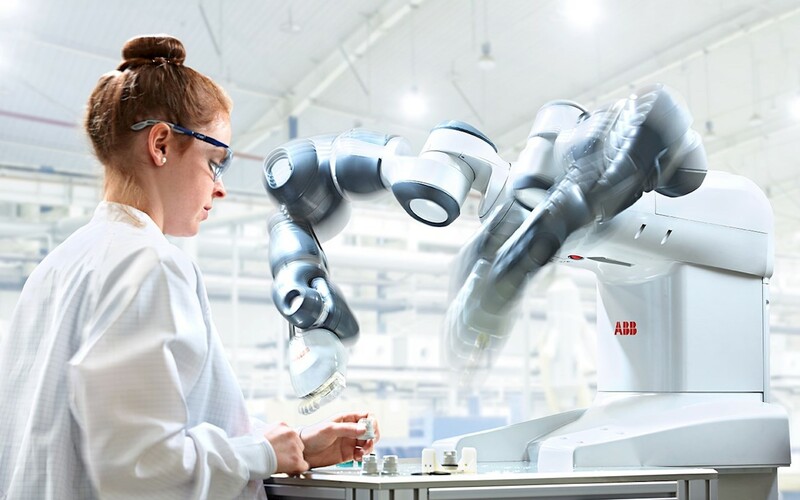 Another example is ABB’s cross industry YuMi® robot, which represents a paradigm shift in robot and human collaboration. YuMi’s flexible dual arms, along with the new single-arm YuMi increase manufacturing flexibility through human robot collaboration while unlocking the full potential of the digital factory. ABB technology is helping companies around the world to take full advantage of automation. ABB is committed to address the opportunities and challenges of artificial intelligence and industrial automation. Augmenting human potential with technology, in a responsible way, while providing ongoing education and training, is an opportunity to drive prosperity and growth for everyone.